The Wanderers finished their fantastic year with another big win as Worcester Cavaliers were beaten 39-12 at Franklin's Gardens on New Year's Eve. 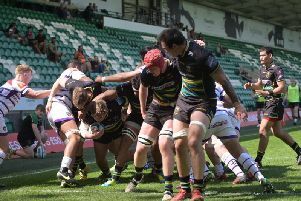 Tries from Tom Stephenson, Reece Marshall, Nafi Tuitavake, Ben Nutley and Mitch Eadie made it eight bonus-point wins in as many Prem Rugby A League matches this season. The Wanderers won the title at the Gardens earlier this year and they have been unstoppable in 2017, winning all 11 of their matches. James Grayson got the scoring started on New Year's Eve as he landed a penalty before Worcester responded with a try from Ben Howard. Grayson put Saints back in front with another three-pointer, with Worcester hit by a couple of sin-binnings. That opened the door and Stephenson scored before Marshall made the most of a direct attack from his team, diving over the line. Ted Hill brought Worcester back into it with a try and Jamie Shillcock converted to leave the score at 20-12 at the break. But the Wanderers marched on and Tuitavake dived onto a Grayson cross-field kick to grab his team's third try. Nutley bagged the bonus point as he barged over from close range and Eadie added the finishing touches after picking up the pieces from a maul. Christian Day was yellow carded before the end, but it didn't matter as the Wanderers cruised to yet another victory. Wanderers: Emery (Dingwall 61); Pisi, Tuitavake, Stephenson (Strachan 61), Estelles; Grayson, Mitchell; Beesley (Trinder 61), Marshall (Clare 61), Painter; Day, Ribbans (Craig 46); Nutley, Ludlam, Eadie.